Molecular gastronomy cooking could sometimes require expensive equipment and hard to find ingredients. This is not the case with spherification recipes. Some of the ingredients used for spherification were hard to find in small amounts years ago but now they are easily available thanks to the popularity of this molecular gastronomy technique created by Ferran Adria at el Bulli. You can buy all the ingredients and utensils at the Molecular Gastronomy Store. 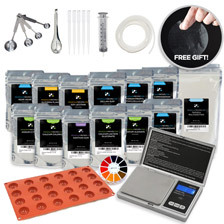 The best way to start experimenting with molecular gastronomy techniques is to buy a molecular gastronomy kit. This is the most affordable way of getting a wide variety of ingredients at a reasonable price. Keep in mind that you usually need one or two grams and sometimes even a fraction of a gram of each ingredient for most recipes so think twice before buying in pounds. 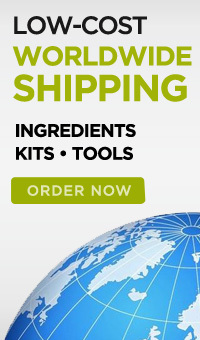 Consider buying from our Molecular Gastronomy Store so we can keep adding new recipes and techniques to this website. 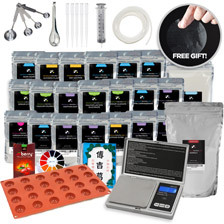 The Molecular Gastronomy Essentials Kit has all the ingredients and tools necessary to make any type of sphere. 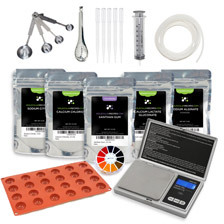 If you are also interested in exploring other techniques, you may want to consider the Molecular Gastronomy Premium Kit or the Molecular Gastronomy Ultimate Kit. There are a few ingredients necessary for Basic Spherification and Reverse Spherification but there are only two that are essential and absolutely required to start the spherification process: sodium alginate and some calcium element. Sodium Alginate: a natural product extracted from brown seaweed that grows in cold water regions. It is soluble in cold and hot water with strong agitation and can thicken and bind. In presence of calcium it forms a gel without the need of heat. Sodium Alginate is used in the food industry to increase viscosity and as an emulsifier. It is also used in indigestion tablets. It has no discernable flavor. Calcium Chloride: used to make the calcium bath for Basic Spherification. This is probably the cheapest of all ingredients and it is used mostly with Basic Spherification because its saltiness does not affect the main ingredient taste as it is only used for the bath. Calcium chloride is a calcium salt traditionally used in the food industry to make cheese and it is also used in many other applications as pickling agent, firming agent, flavor enhancer, stabilizer, etc. It is very soluble in water and it must be kept in tightly sealed containers. Calcium Lactate: used to increase the calcium content of the main ingredient in Reverse Spherification. It provides a less bitter taste than calcium chloride when added to the main ingredient. It will dissolve in fat. It is traditionally used in foods as a baking powder and to make aged cheeses. It is often added to sugar-free foods to prevent tooth decay and to fresh cut fruit to keep it firm and extend shelf life. Calcium Lactate Gluconate: it is ideal to increase the calcium content of the main ingredient in Reverse Spherification. The main ingredient consistency and flavor is not altered by the addition of calcium lactate gluconate as it has no discernable flavor and dissolves in cold liquid without altering its density. It is versatile as it can be used in liquids with high acid, alcohol or fat contents. To avoid difficulties in dissolving, add calcium lactate gluconate before any other powder product. Sodium Citrate: can be used to reduce the acidity of the main ingredient when doing Basic Spherification. The Basic Spherification process does not work if the main ingredient is too acidic (PH<3.6). Sodium citrate has a sour taste as well as having a salty taste so use with moderation when adding to the main ingredient not to alter its taste too much. Sodium citrate is usually used in the food industry as an additive for flavor and as a preservative. It is used in club soda and most lemon-lime soft drinks for their sour and salty flavors. Xanthan: used to thicken the main ingredient in Reverse Spherification. When the main ingredient density is too liquid to form spheres in the alginate bath, a thickener like Xanthan is used. It is obtained from the fermentation of corn starch with Xanthomonas campestris bacteria (found in cabbage). It is gluten free and can be used as a substitute for gluten in baking (used along with non-gluten containing flours). Soluble in hot or cold water, stable over a range of pH and temperatures, can thicken items with a high alcohol content, compatible with and stable in systems containing high concentrations of salt. There are several utensils that will definitely help you obtain better spherification results but all the essential tools are included in the Molecular Gastronomy Essentials Kit, the Molecular Gastronomy Premium Kit and the Molecular Gastronomy Ultimate Kit. Scale with 0.1g precision: most of the recipes require very low amounts of “molecular” ingredients, usually fractions of a gram. To be successful with spherification it is important to be precise and use a scale with such precision. Scales with a large weighing range and this precision could be really expensive but scales that can only weigh up to 200g or 500g are much more affordable. You can then have another 1g precision scale for weighing heavier items. This is probably the most essential piece of equipment you need even though there are charts out there to convert the molecular gastronomy chemicals’ weight to volume so you can use a measuring spoon instead but this is not very precise. The density of the ingredient is very sensitive to packing of the powders and it can also vary by brand. Included in the Molecular Gastronomy Essentials Kit, the Molecular Gastronomy Premium Kit and the Molecular Gastronomy Ultimate Kit. Dosing spoons: used to pour the main ingredient into the bath to form the sphere. A set of measuring spoons with spherical shape is recommended since they conveniently come in different sizes to create ravioli, gnocchi, etc and are inexpensive. Included in the Molecular Gastronomy Essentials Kit, the Molecular Gastronomy Premium Kit and the Molecular Gastronomy Ultimate Kit. Collecting spoon: used to remove the spheres from the bath. A small slotted spoon will do the job perfectly. It is better if they are metallic so the sphere can slide easily from the spoon on to the plate. Some plastic spoons have a rough surface that prevents the sphere from sliding off the spoon. Included in the Molecular Gastronomy Essentials Kit, the Molecular Gastronomy Premium Kit and the Molecular Gastronomy Ultimate Kit. Syringe: used for creating caviar. Just a regular syringe without the needle is needed. If you need to produce caviar in high quantities consider getting a Caviar Maker. Included in the Molecular Gastronomy Essentials Kit, the Molecular Gastronomy Premium Kit and the Molecular Gastronomy Ultimate Kit. PH Indicator Paper: used for measuring the acidity (PH) level of the main ingredient when doing Basic Spherification since it doesn't work if the PH level is below 3.6. Included in the Molecular Gastronomy Essentials Kit, the Molecular Gastronomy Premium Kit and the Molecular Gastronomy Ultimate Kit. Flat pan for the bath: ideal for Reverse Spherification because the spheres tend to stick together if they become in contact with each other. If you use a bowl, it will be harder to keep the spheres separate as they will all flow into the middle of it as you pour the main ingredient into the bath to create multiple spheres. Immersion blender: used to dissolve the sodium alginate which only dissolves with strong agitation. It is also used in several recipes to prepare the main ingredient and mix the xanthan gum. Fine Skimmer: used to collect caviar spheres from the bath and rinse them under running water to remove the extra calcium on the surface. Use a skimmer with small holes so the caviar spheres can’t go through. You can use the collecting spoon but a larger fine skimmer will be faster. Fine Sieve and Cheesecloth: several recipes require passing the main ingredient through a fine sieve and sometimes through a sieve lined with cheesecloth to obtain a smooth liquid with ultra small solid particles. This is an inexpensive alternative to using a superbag, a porous bag that works as an extraordinarily fine filter that won’t impart a metallic taste to delicate ingredients, plus is flexible yet durable, heat resistant and dishwasher safe. If you can afford a superbag, I recommend it. You’ll get better results. Appetizer spoons: some of the spheres are very delicate to be handled by hand or with spoons by the diners so you’ll have to carefully place them on appetizer spoons to be served. This is particularly necessary with basic spherification spheres due to their more delicate membrane. Chinese soup spoons work great as appetizer spoons and are inexpensive. Congratulations! You finished the Spherification Course! Now you are ready to start experimenting and practicing Spherification Recipes.